Yukari was enjoying her single life when her elder twin sister, Ayaka, suddenly pays her a visit to ask her for some strange advice, and brings along a guy she met in Hong Kong with her! This is a story about a set of mismatched twins. Futago has offered to me the possibility that there are mangas out there that, right down to the bone, have the edge and charm to offer the reader a story that feels real. Having only read 9 chapters, waiting (somewhat impatiently) for the next, I can't be a good judge, but what I've seen so far is incredibly promising. 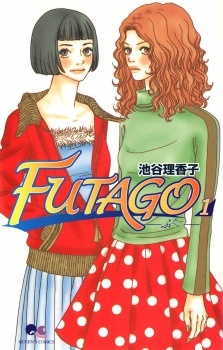 Futago tells the story of two unidentical twins who have grown up apart. One is a woman enslaved to her writing craft-Yukari, often not leaving her room in her apartment for days until she can get the next chapter down, the other is a feminine, married lady named Ayakawith charm and poise about her. They couldn't be more different, right down to the way they look. What changes the rather, absent, relationship between the two is when Ayaka returns from Hong Kong, bringing with her a man who is clearly not her husband but obviously holding unrequited feelings towards her, and asks Yukari to let him stay at her flat. I think what the mangaka has done has given me my first manga which could be real, which could happen. I can almost see the characters spring to life and step out the pages. Its Josei, right down to the bare bones. Not a crossover, not a Shoujo in denial. No sparkly eyed teens with tiny waists and an anatomically impossible bust size for someone so small. No manly, but at the same time vulnerable and ever so devestatingly handsome with the girls falling at his feet, guy. And no stupid plot lines somehow bringing these two protagonists together, to only be pulled apart by - love rivals/hidden dark pasts/scheming parents/love triangles - on numerous occasions but somehow wonderfully resolve at the end. Futago is a wonderful, real feeling manga I urge you to read. For once, the mangaka has got it spot on, and I can't fault it. I'm really enjoying this manga! Futago is about twin sisters that doesn't look alike. One is black-haired, lovely, quiet, when the other is the complete opposite. Their parents divorced and they got separated, but now, because of the appearence of a strange young guy, they are together again. The art is lovely, but nothing OMG outstanding, and sometimes makes me remember of Paradise Kiss (but better).